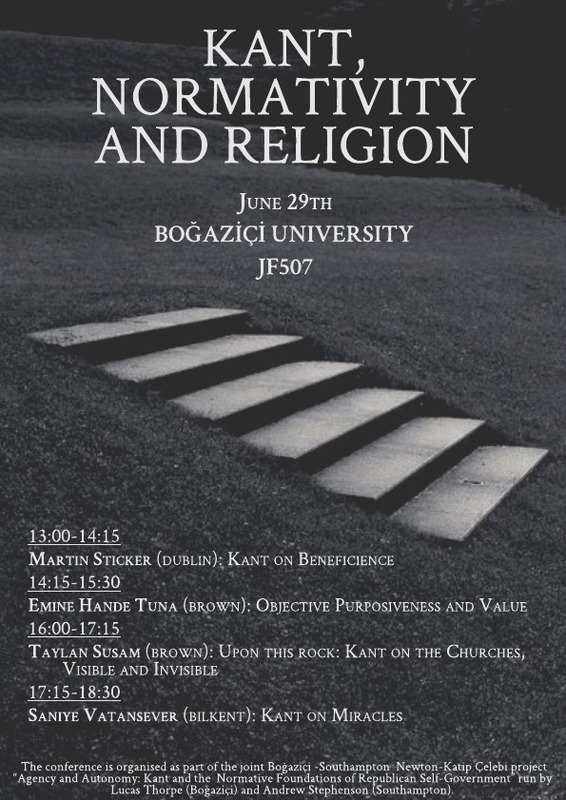 The workshop will take place at Boğaziçi University, on Friday June 29th from 1pm until 6.30pm in JF507. Everyone is welcome. The conference is organised a part of the joint Boğaziçi -Southampton Newton-Katip Çelebi project “Agency and Autonomy: Kant and the Normative Foundations of Republican Self-Government”, run by Lucas Thorpe (Boğaziçi) and Andrew Stephenson (Southampton). Abstract Since the attacks of 9/11, there has been a revival of interest in philosophical studies of evil, which suggest that we are forced to rethink the category of evil as we face acts of terrorism on a global scale. In almost all of these studies, Kant, Arendt and Levinas appear as key thinkers of evil. This paper traces the idea of the inscrutability of evil as a common lens through which we associate the category of evil with the phenomena we identify as evil. This idea finds its first modern formulation in Kant’s theory of radical evil. Although Arendt and Levinas challenge the Kantian framework of evil through their accounts, I argue that they nevertheless presuppose this framework. Regardless of their difference from Kant, my argument stresses that Arendt’s identification of Nazi evil as banal (i.e., without depth) and Levinas’ description of evil as “useless” are both developed in the trajectory of thought facilitated by Kantian philosophy. This trajectory is marked by evil’s non-theological root and its basis in human freedom. My analysis concludes that the idea of the inscrutability of evil is common to all three approaches, yet their accounts of why evil is inscrutable differ considerably. The emergence of analytic philosophy towards the early 20th century shows interesting parallelisms with the concomitant international auxiliary language movement. Both these projects are characterized by their universalist assumptions and their constructive approach to language. Even though international auxiliary language is more clearly political in its objective of unifying people through national borders, many important figures of the early analytic philosophy also supported internationalism. Beyond the fact that some of these (like Peano, Couturat and Carnap) also took part in the movement for an international auxiliary language, we argue that the Enlightenment- inspired rationalism of the early analytic philosophy connects it to political and linguistic internationalism on a deeper level. What is the Place of the Individual in Marx’s Philosophy? ABSTRACT: The problem of the individual is still the overriding political problem of contemporary society, which takes individual freedom to be the basic political principle. However, while the existing political system is accessible for the people and is dependent on the government of the people, it does not permit the people to govern; it is not governed by the people. It merely pretends that people govern the political state. In this paper, the individual will be considered as the single individual as distinct from the species-being which was particularly highlighted by young Marx. Or, speaking in terms of logic, we will distinguish the individual from the universal. It can be easily observed that Marx does not treat the problem of the individual in the same way that, for instance, Hegel did. In other words, he does not take up the subject systematically as regards its ontological, logical, political and ethical dimensions. Nevertheless, it is a fundamental question for Marx. He tries to answer in which way or through which political manner society can attain such a level of “freedom” and “equality” as to embrace every single being—individual— in this planet as a social being under the same sun and stars. In this respect, the concept of the individual will be elaborated in terms of the concepts of freedom, alienation, labor (specifically in relation to capital), species-being, society and finally, the state through an analysis of Marx’s texts. For Marx, the problem is not only associated with the political existence of the individual in the modern state; it is directly interconnected with the economy. That is what differentiates Marx from Hegel because Hegel in particular concentrates on the ontological existence of the individual and society. However, the economic aspect is largely missing in his philosophy. The basic question is whether the individual is really overlooked by Marx’s project. I will focus on the problem of the individual especially in Marx’s early texts. It is my intention to analyze the problem of the individual in the modern state in light of Marx’s farsightedness. Marx’s early texts can be analyzed according to the ontological and political existence of the individual. From a Marxist ontological perspective, which has decided an economic dimension, the individual must be analyzed in the context of the notion of “relation.” In this regard, the first argument of this paper is that the individual in modern society is separated from his social relations and reduced to market relations. The relationship between all individuals and their relationships with institutions such as the state are dependent on and governed by exchange value. Marx presents this argument in his well-known work, Grundrisse, by way of an analysis of the producer-consumer dialectic, but he had already begun to develop these ideas, albeit in less elaborate form, in the Manuscripts of 1844. Therefore, the Manuscripts can help to elaborate this concept of “relation.” Depending upon the first argument— which focuses on the ontological perspective—, this second argument will demonstrate from a political perspective, that the claim that the individual is a political being is what, paradoxically, separates individuals from their political activity. Here Marx demonstrates that individuals are real individuals as long as they realize themselves within politics. However, political emancipation is not the only road to or the full development of emancipation. I would like to draw attention to the fashionable view that Marx is not concerned with the problem of the individual and focuses on society only. In his early writings, for example, in the Manuscripts of 1844, in his critiques of political economy (as well as his critiques of Hegelian dialectic) Marx speaks of the individual. I believe that Marx, through his economic and ontological analyses, first indicates how the individual loses his/her relationships and by an elaborated and extensive investigation in the Critique, Marx shows the—loss of—relationship of the individual to the state and civil society. At the end, having looked in detail at and analyzed Marx’s writings, particularly those in which he speaks of the state, society, and man in detail, I find that Marx is indeed interested in the problem of the individual. corrects the faulty conception of Aristotle as a banisher of wonder. Bessarion’s translation suggests that Aristotle calls upon us to wonder at how all things in the heavens and below the moon, from the political, to the biological, to the mechanical, imitate the Unmoved Mover.